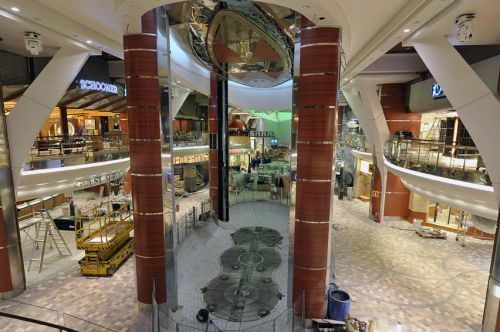 ﻿﻿﻿﻿ Allure of the Seas, Royal Caribbean International’s newest megaship (carries 5,400 guests), will sail its first week-long itinerary from Fort Lauderdale, Florida on December 5, 2010. Allure of the Seas joins sister ship Oasis of the Seas as the world’s two largest and most innovative cruise ships. 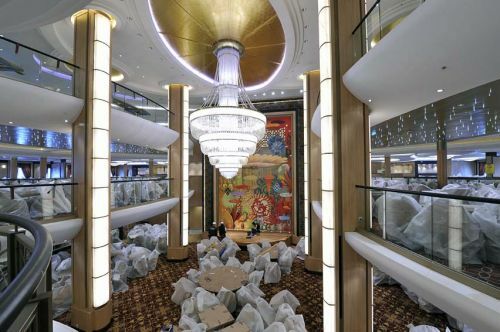 Billed as a “city at sea,” Allure promises to be a truly amazing ship. Along with Oasis, Allure of the Seas features the seven neighborhood design concept, highlighting lush Central park open to the sky. It’s a gardener’s dream with live plants and a “green” wall covered with flowing vine that spans 25 feet and soars five decks high. A custom-designed irrigation and drainage system and micro-climate control techniques give Mother Nature a little help in this special environment. Other themed neighborhoods include Boardwalk, which features a hand-carved carousel, Royal Promenade, Pool and Sports Zone, Vitality at Sea Spa and Fitness Center, Entertainment Place, and Youth Zone. Advanced information promises something for everyone in the entertainment department--from immersive DreamWorks Animation and 3D movie screenings to the at-sea premier of Broadway’s longest running theatrical production, “Chicago: The Musical,” ice skating shows, a spectacal of aerial acrobatics called “ Blue Planet,” and unique AquaTheater productions. ﻿﻿ Hallmarks of Royal Caribbean ships that are featured onboard the Allure include the FlowRider surf-simulator, climbing wall, Royal Promenade and Adventure Ocean kids program. Specialty dining options run the gamut from Rita’s Cantina, an eclectic Mexican dining venue, to 150 Central Park, an upscale and intimate restaurant. I’ll be on a special media excursion of Allure of the Seas later in November and will provide first-hand reports about cabins, amenities, entertainment, and environmental and safety features. Allure of the Seas--Is It Too Big?